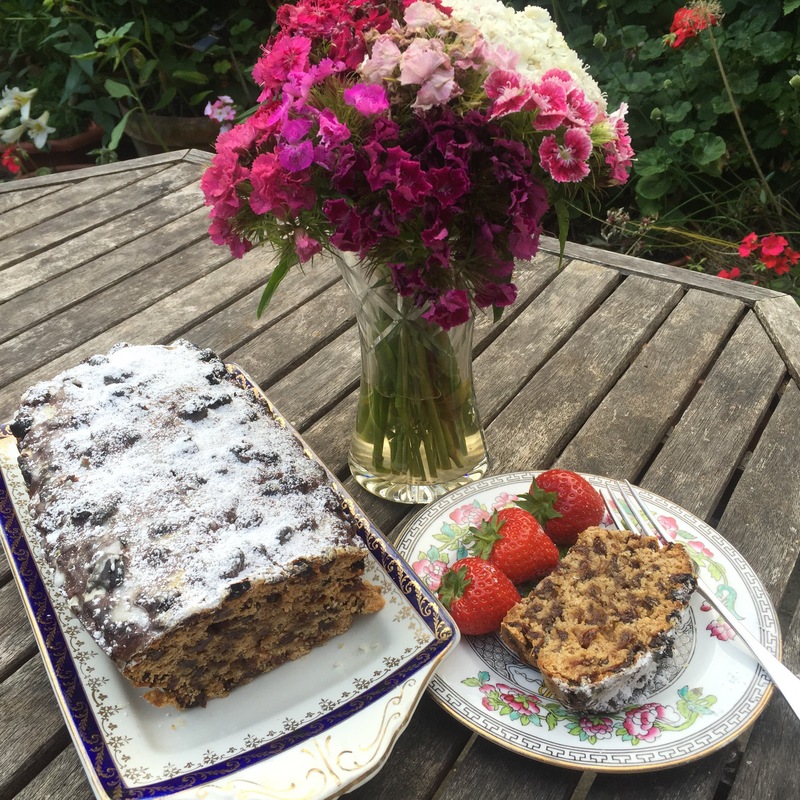 I love sitting in the garden in the summer surrounded by flowers with a big pot of tea and scones for tea! 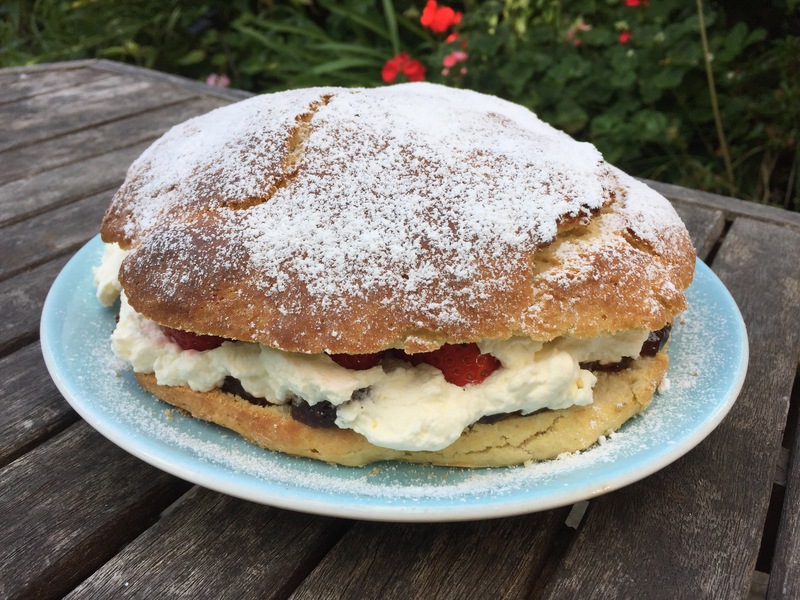 So what could be better than a Giant Victoria Scone Cake. 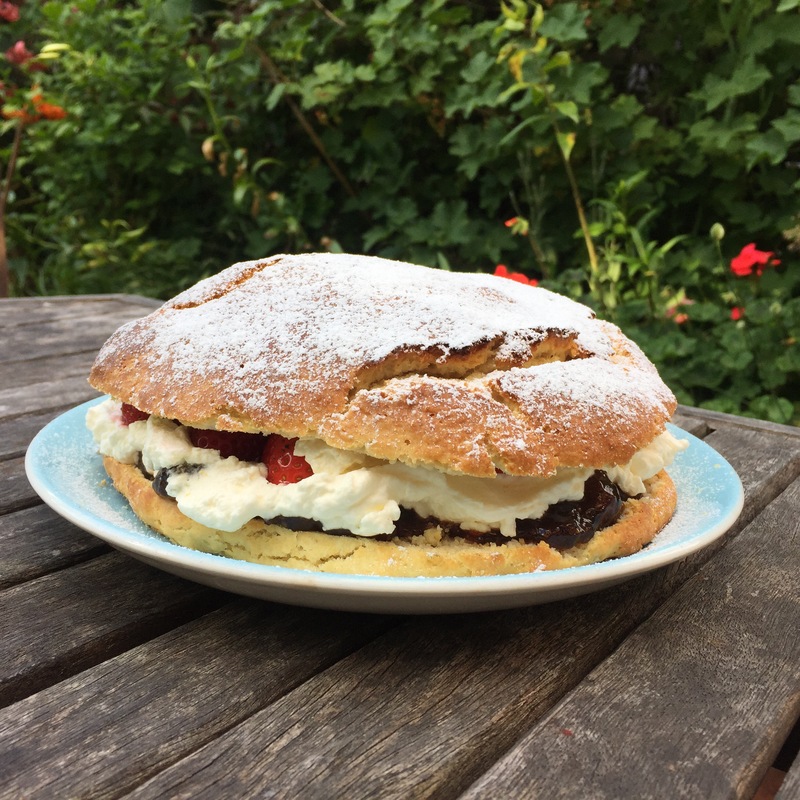 One giant scone, sliced in half and filled with freshly whipped cream, homemade jam and berries from the garden. Yum! – Heat the oven to gas mark 7 and line a large baking tray. – If using milk and lemon juice, combine in a jug now and let it sit for a bit. – Place the flour, salt and baking powder in a large mixing bowl and give a quick stir to combine. – Add the butter and use your fingers to rub it in until the mixture resembles fine breadcrumbs. – Add the milk and mix until all the flour is incorporated. Try not to mix too much, a light hand gives a better scone. – Tuen out the dough directly on to your lined baking tray. Scrape down the sides for any spare dough as this mix should be quite sticky. – Flour your hands well and lightly pat the dough into a round cake. – Brush the top with milk. – Bake for 25 minutes until firm and just browned. 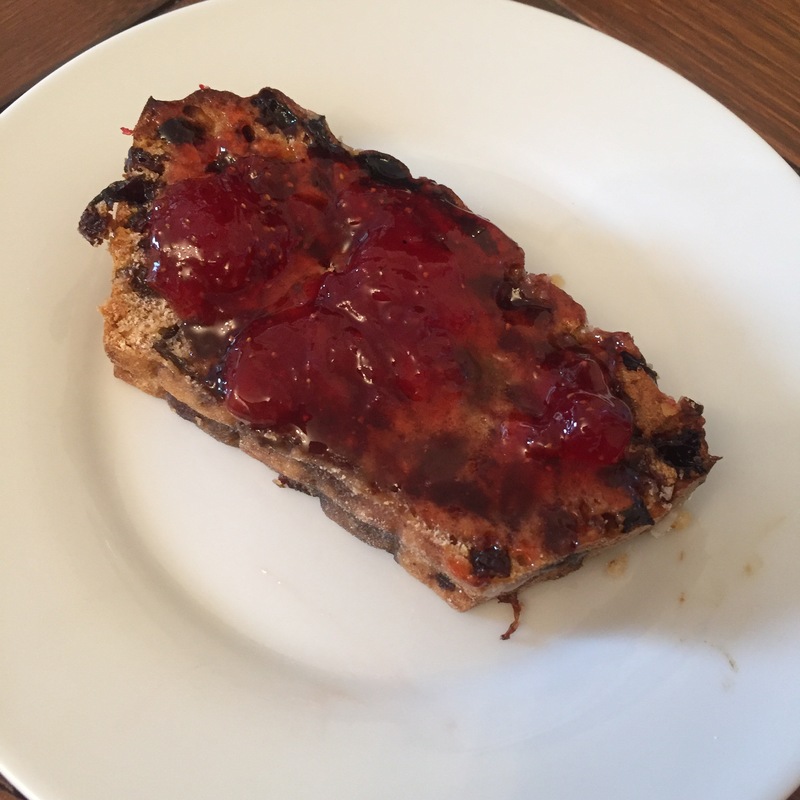 – Leave to cool almost completely before splitting in half and spreading with jam. Fill with whipped cream and fresh berries. 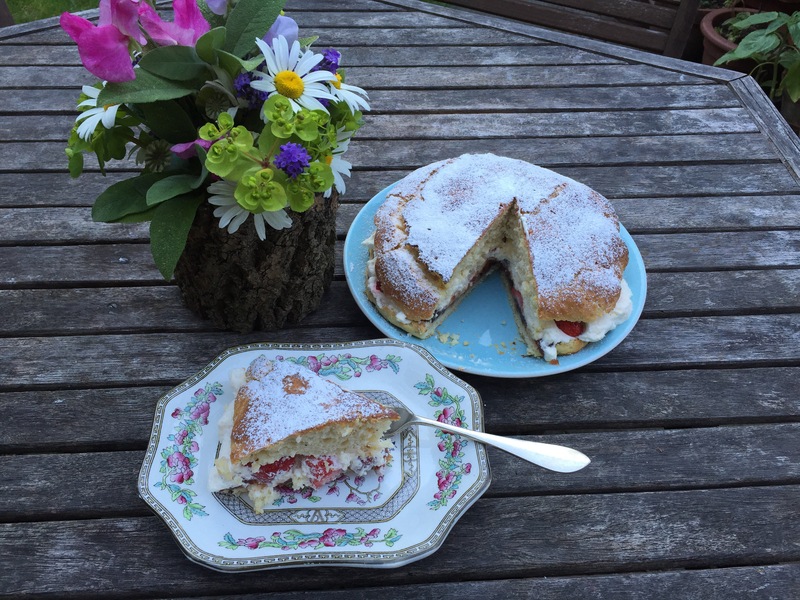 Dust with icing sugar and enjoy! My final day on rations and I started with my coveted fresh egg! 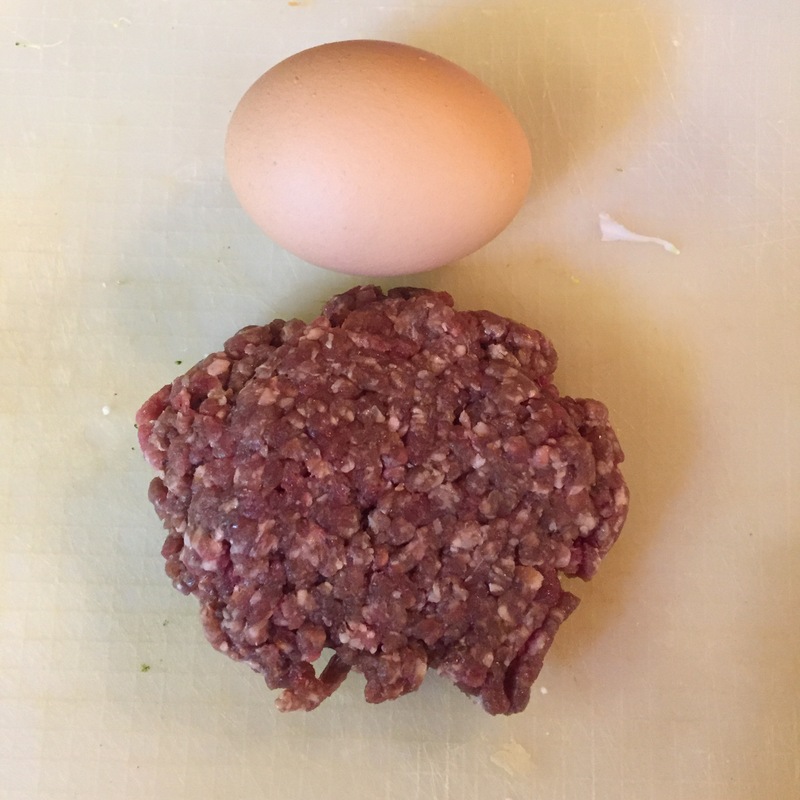 If you have been following along you’ll have seen that I have been forced to use a couple of fresh eggs previously but they were stand ins for the unobtainable dried egg powder. This one was the real deal, no way you can recreate a fried egg with that stuff! 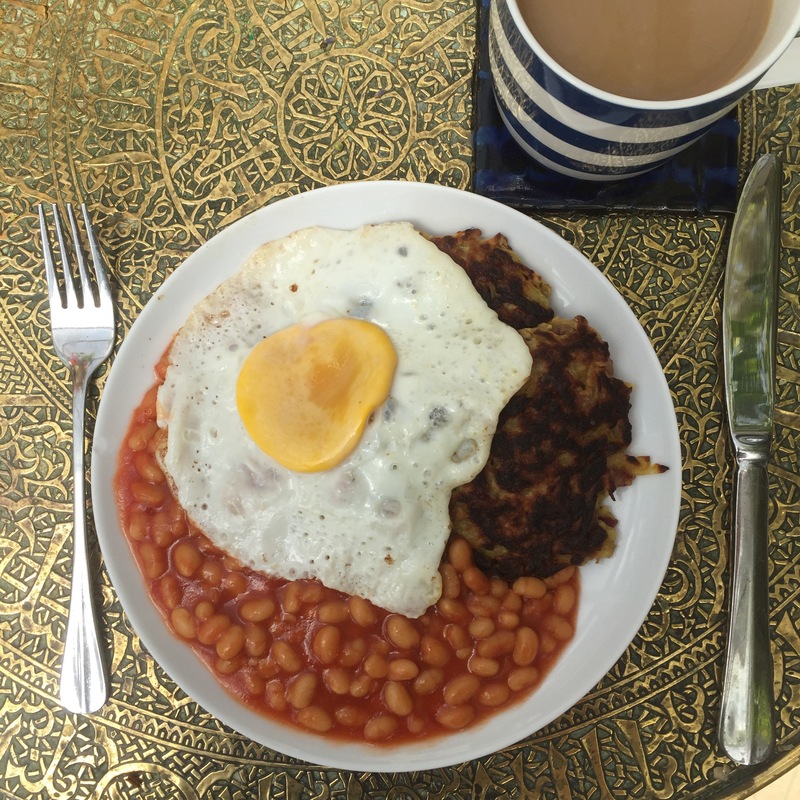 I had leftover Bacon and Potato Cakes from last night and some leftover baked beans so together it was breakfast! 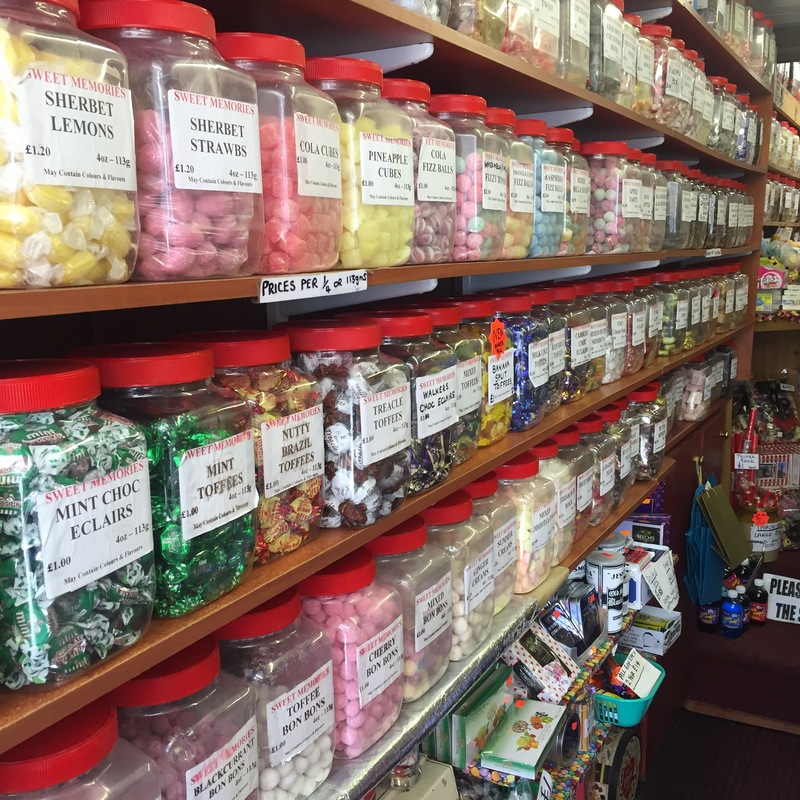 I popped into town to run some errands and hit the old fashioned sweet shop for my sweet ration. I should have done this at the beginning of the week but I had been saving my sweet ration for chocolate. On further thought though, chocolate is for in a flash. 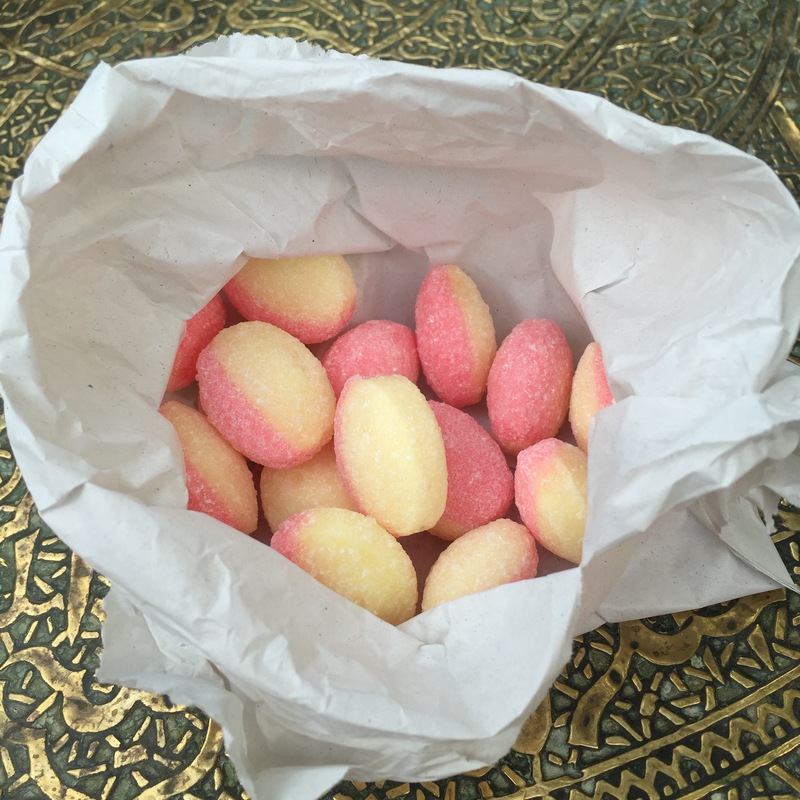 Rhubarb and custards, on the other hand, last much longer! The other reason I forewent my chocolate ration was that I knew I had these waiting for me at home. 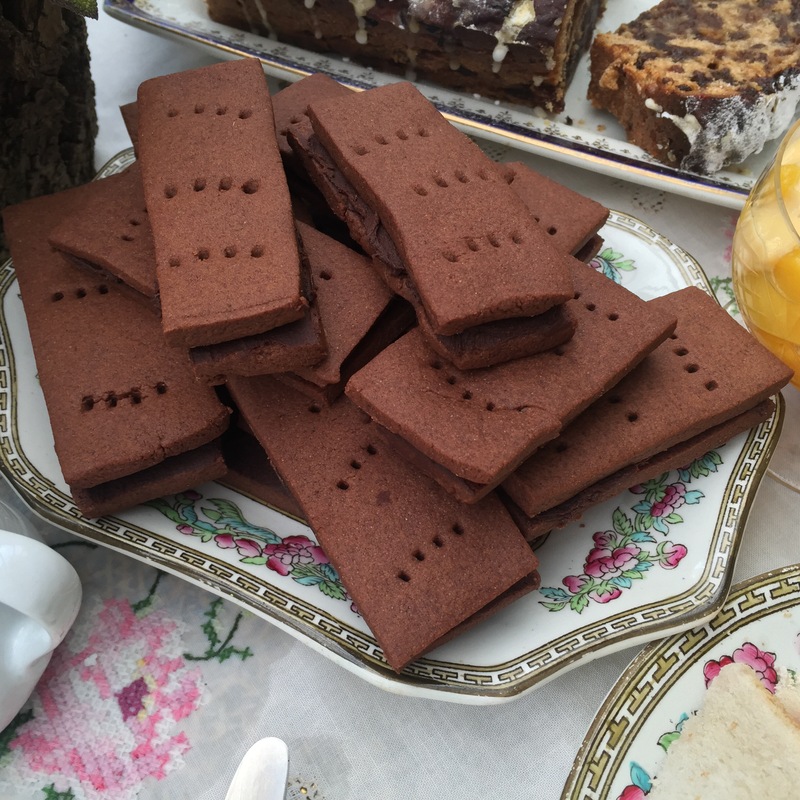 For my final day of rationing I was planning a picnic high tea to honour with a bang, these Bourbon Biscuits were perfect for it! Economical Bourbon Biscuits: Cream 3oz margerine with 2oz caster sugar and 2 tbsp golden syrup. Sift in 6oz plain flour, 1oz cocoa powder and 1oz corn flour. Mix with your hand to form a dough. Roll out the dough to 3mm thick and cut into equal rectangles. (*cough* equal, smeaquel! *) Place on a baking tray and prick with a fork. Bake at gas Mark 3 for 12 minutes. Leave to cool on the tray. For the icing cream together 1 1/2oz butter, 1 1/2oz cocoa powder and 2oz icing sugar with a few drops of milk. Spread thinly on half of the biscuits before sandwiching together. 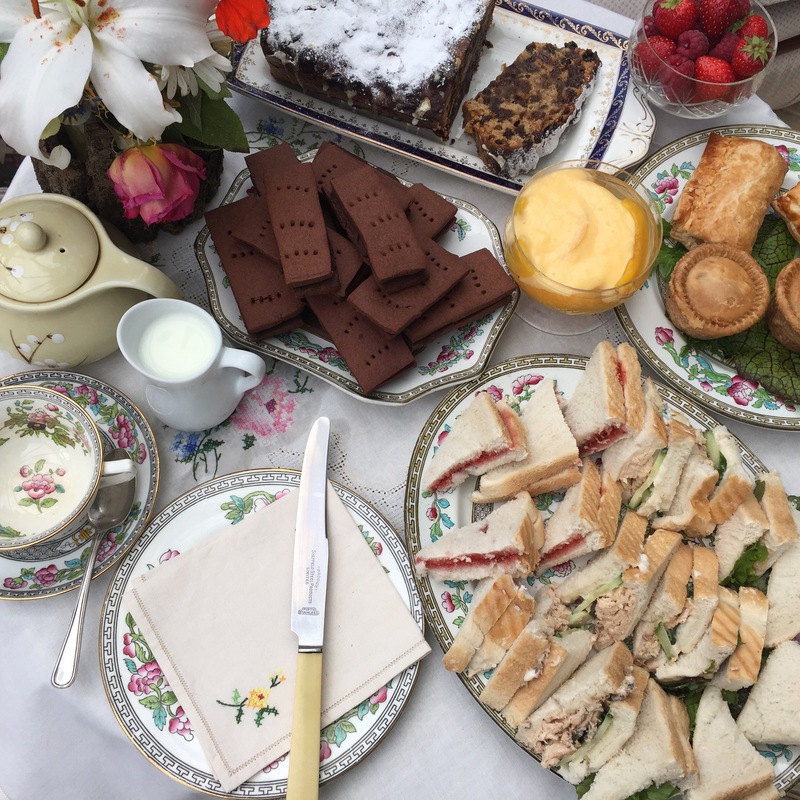 The rest of my High Tea (which ended up having to be taken in the conservatory because we’re British and if you plan a picnic it rains!) 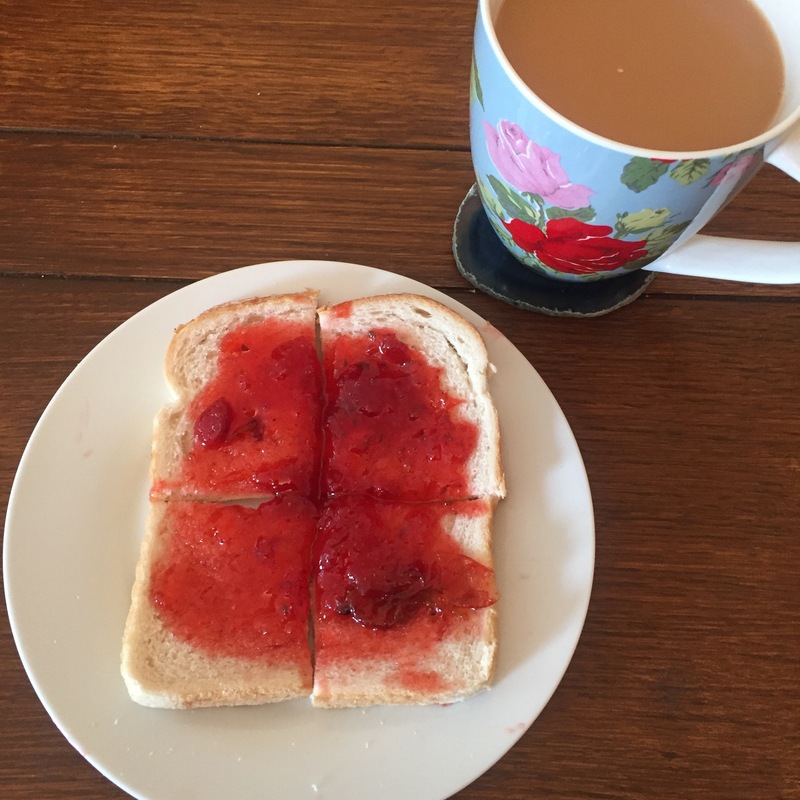 consisted of the Honey Tea Loaf from Day 5 with finger sandwiches (One of the ladies I spoke to about her memories of rationing said that you always knew when it was a special meal because the sandwiches got smaller! 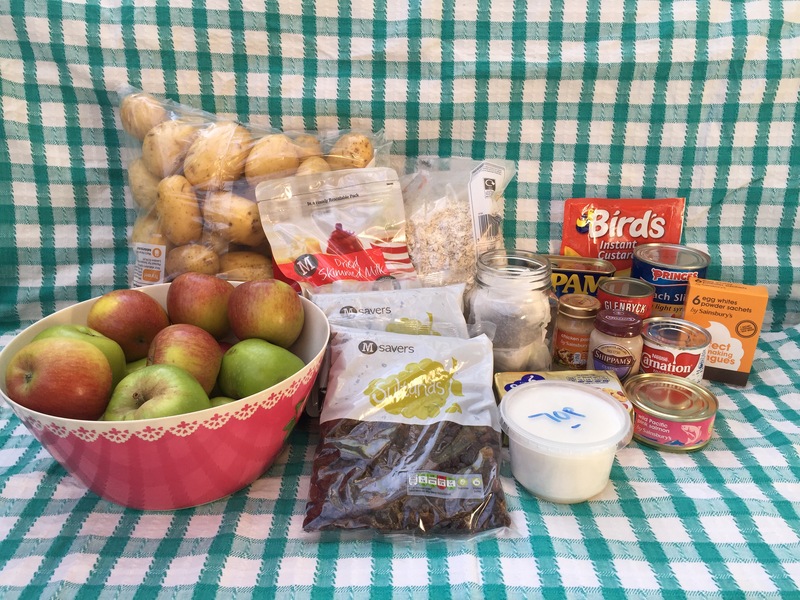 ), sausage rolls and pies, fresh berries from the garden and tinned peaches with custard. I felt it was definitely a proper send off to ration week! I’ve really enjoyed this challenge and I hope you have too. It’s been such an experience seeing what I can work with to make things go furthest! But I have never once been hungry or felt a lack of anything. That being said, it has been exhausting! Planning 3 meals a day and cooking them has been a time consuming endeavour and that’s without having to do all the washing up by hand too! I look forward to cooking things that only require one pan again! I hope I’ve shown you a good cross section of what was available to people living in 1951. 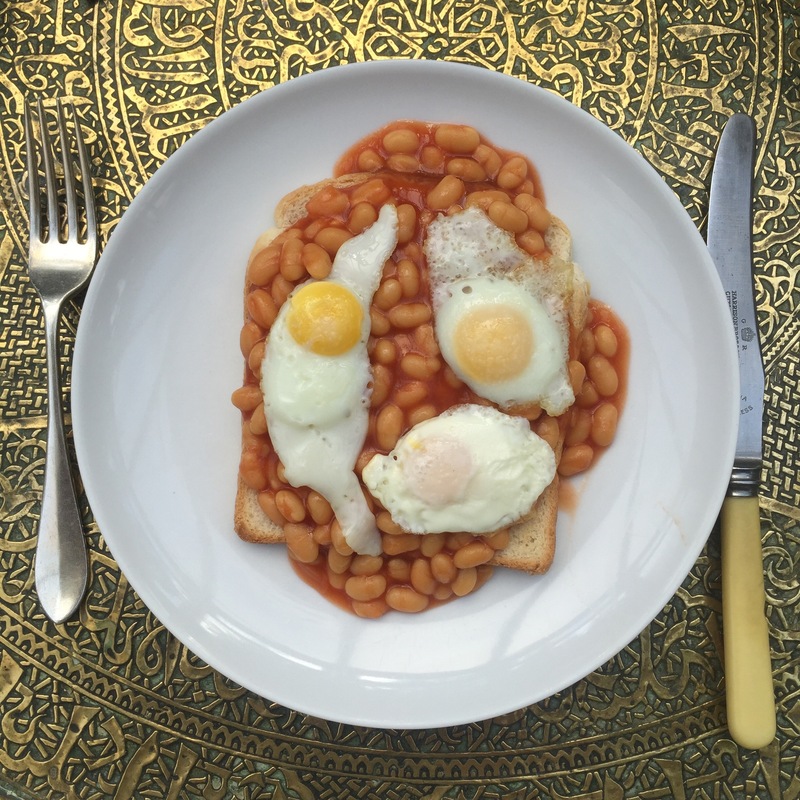 I’ve tried to come up with different foods every day to show you the breadth of foods on offer. I could easily have made most of these recipes go further and make at least 2 meals rather than just one. I am very proud of my puddings and cakes though and all of that was achieved with just one person’s rations! 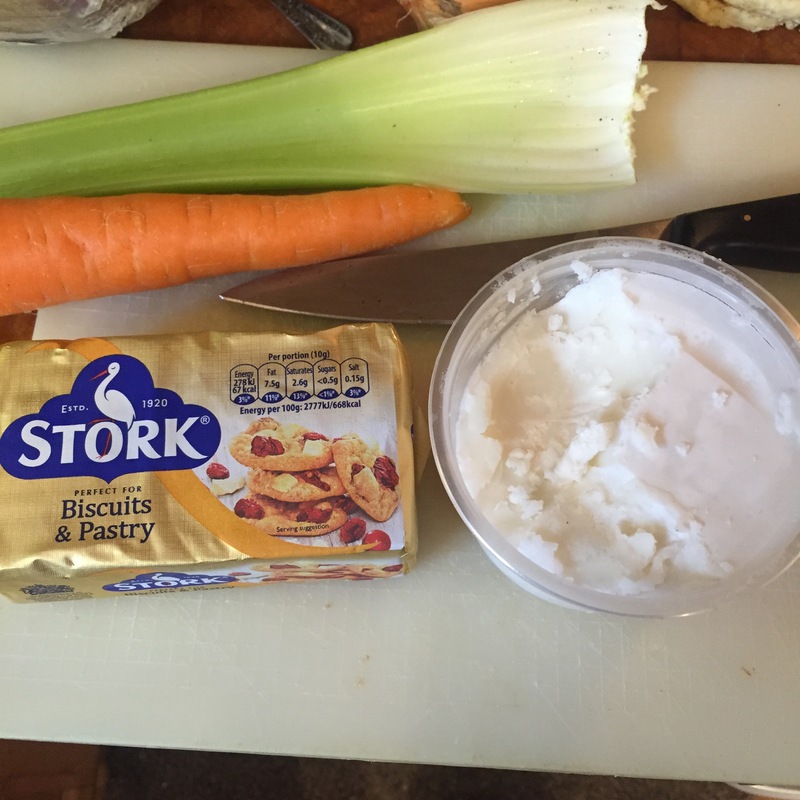 I’ve rediscovered a love of mashed potato and have got some new recipes to add to my repertoire. I’m especially looking forward to eating the Sausages In Cider from Day 4 again! The Festival of 50s is happening at Beamish Museum from the 14th to the 17th July so if you fancy more of a taste of 1950s life get yourself along! 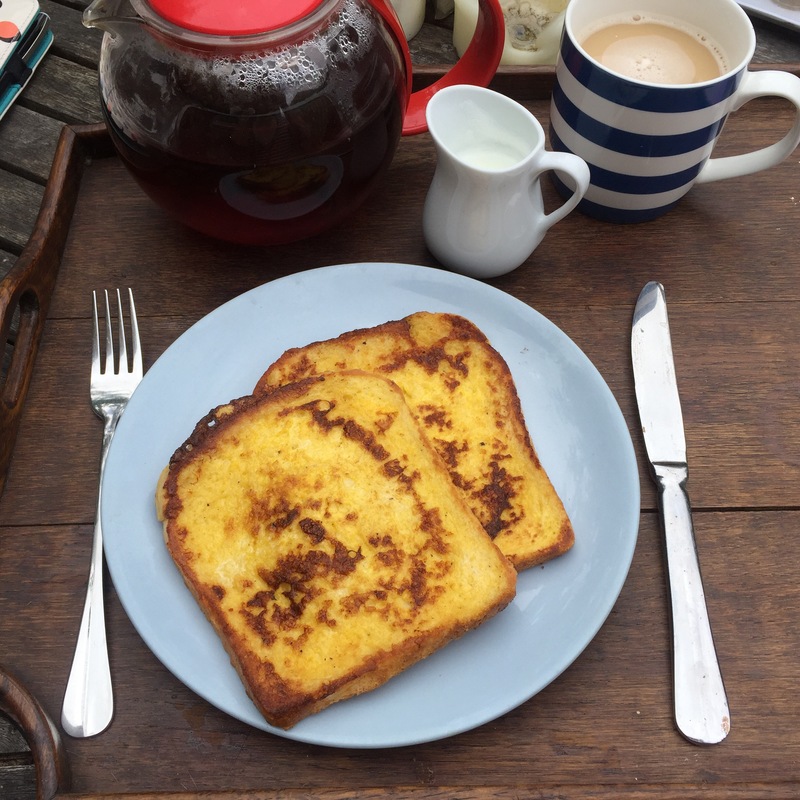 Today started well with eggy bread. I was going to make this with reconstituted dried egg powder but I just haven’t been able to find any! I was then going to use the dried egg white powder I’d found but after using it yesterday I was covered with an allergy rash. It could have been something else I touched but I did have an egg allergy as a child and still can’t have vaccines cultured on egg so chances are it was that. So, I fully confess I cheated and used a fresh egg for this bread. Eggy Bread: Mix 1 egg, splash milk, salt and pepper in a shallow bowl. Melt a scant tap of fat in a large frying pan. Dip 2 slices of bread in the egg on both sides then straight into the pan. Cook until browned on the first side then flip and cook until browned on the other side. Lunch was the fabulously vibrant beetroot soup! I spared some of my margerine ration to smear on the bread and indulged in a sausage roll as I’d been working hard in the garden all day! 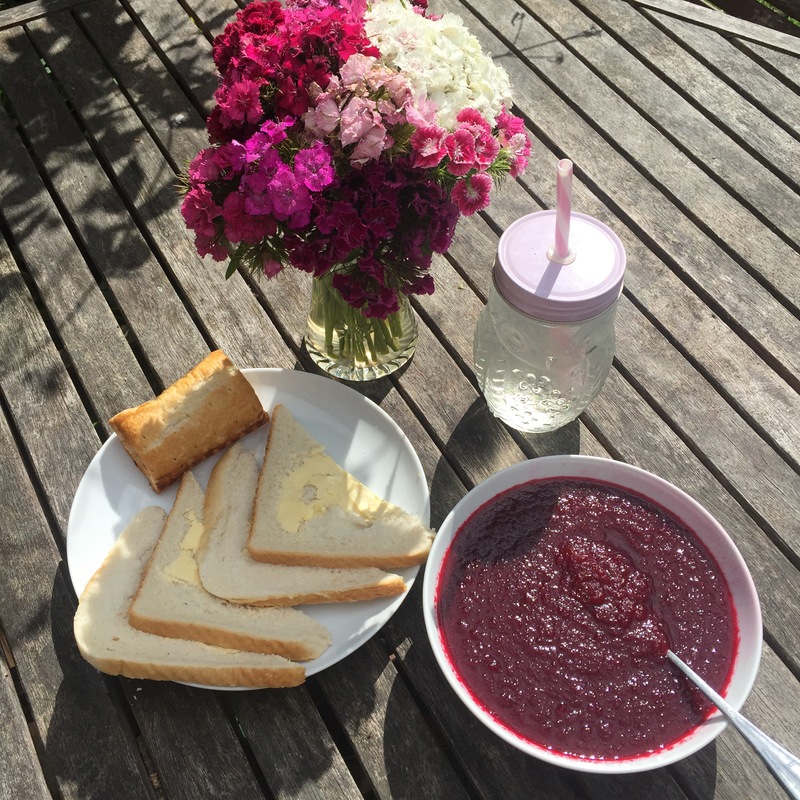 Beetroot Soup: Place 3 cooked beetroots, peeled and diced, 1/2 oxo cube, a good pinch salt and a splash of Worcestershire sauce in a pan and cover with water. Bring to the boil and simmer for 15 minutes. Either push the beetroot through a sieve or use a stick blender to purée it. Check for seasoning and serve. 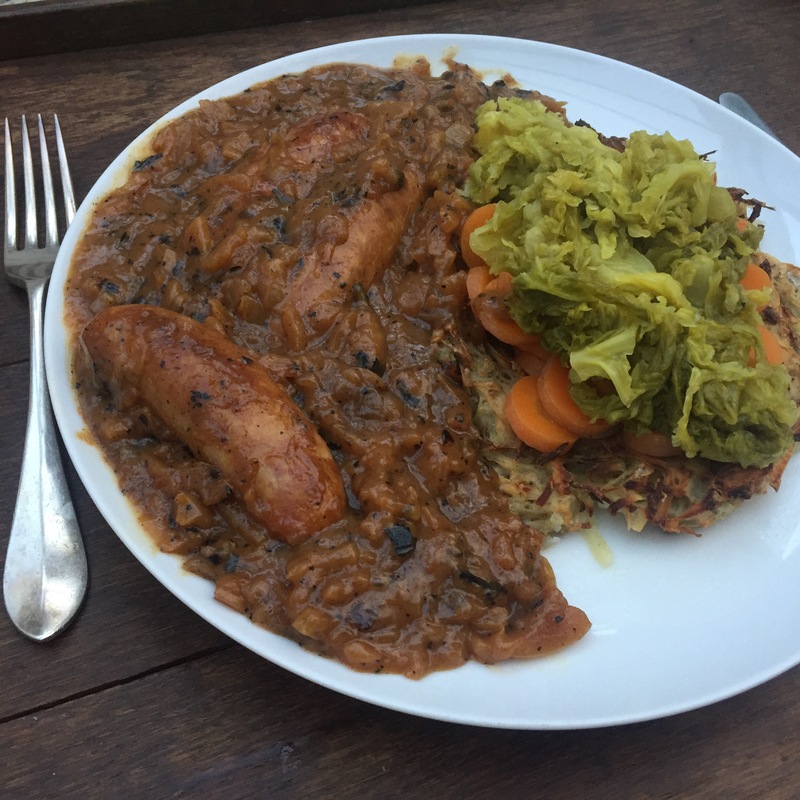 I decided to push the boat out a bit for dinner tonight and go for Sausages in Cider with a Potato Ring, braised cabbage and carrots. I’m a bit weird about fruit in my main courses but this sausage and cider stew was amazing! It’s definitely going to enter frequent rotation come the Autumn, it was gorgeous! The Potato Nest was a bit faffy for something that looked kind of cool but otherwise didn’t wow me. And when a wartime recipe tells you to grease your baking tray well you should listen to it because they didn’t waste fat if they didn’t need to! I tried to save my fat ration and do without and ended up with it stuck to the tray! 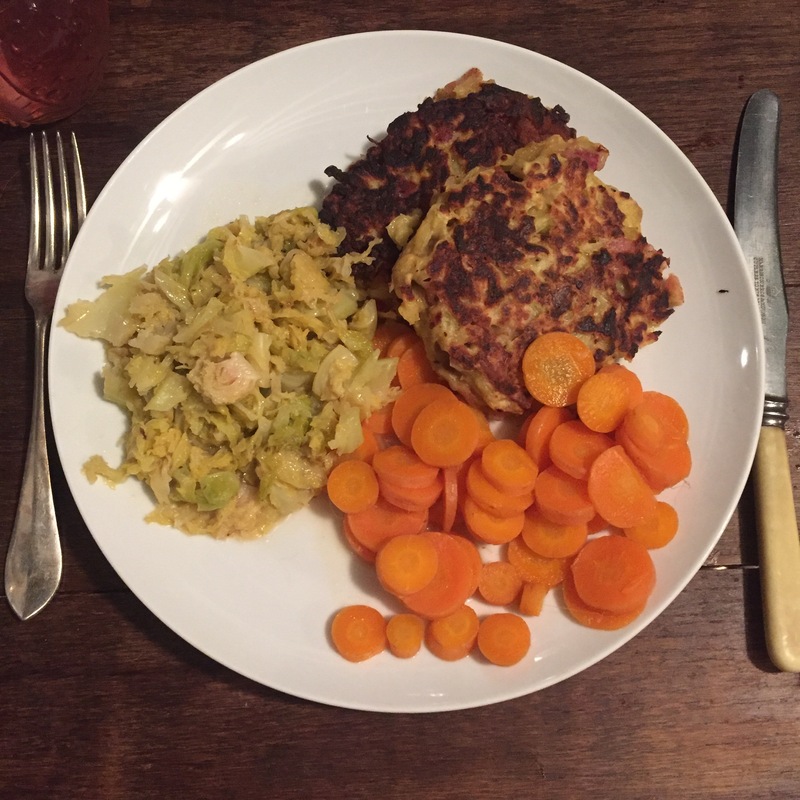 Braised cabbage was a saviour. I would normally fry the cabbage in some fat first, sometimes using bacon lardons but here you simply use the stock, which adds a whole lot of flavour and the slow simmering adds a nice sorry so that the cabbage actually tastes like it should, unlike that boiling fiasco! Boiled carrots rounded everything off. Sausages in Cider: Brown 4 oz sausages in a heavy bottomed pan. (Cheap sausages help here as the fat content means you don’t need to use extra fat!) add 1 sliced onion and 1 thinly sliced dessert apple with a good pinch of salt and sprinkle of pepper. Place the lid on the pan and cook for 2 -3 minutes until the onion and apple are softened. Add half a pint of cider and simmer for 20 minutes. Add 2 tsp corn flour to a little water then mix into the stew and stir until thickened. Potato Nest: Grate 3 medium potatoes and mix with 2 oz self raising flour and a good pinch of salt. GREASE your tray well and shape into a ring. Bake at gas mark 6 for 30-40 minutes. Braised Cabbage: half full a pan with chicken stock. Add sliced cabbage to fill the pan and put the lid on. Simmer until almost all of the liquid has evaporated. Check to see if you need to add any salt as the stock should be salty enough. As it’s Sunday I thought I’d try a fancy dessert recipe! 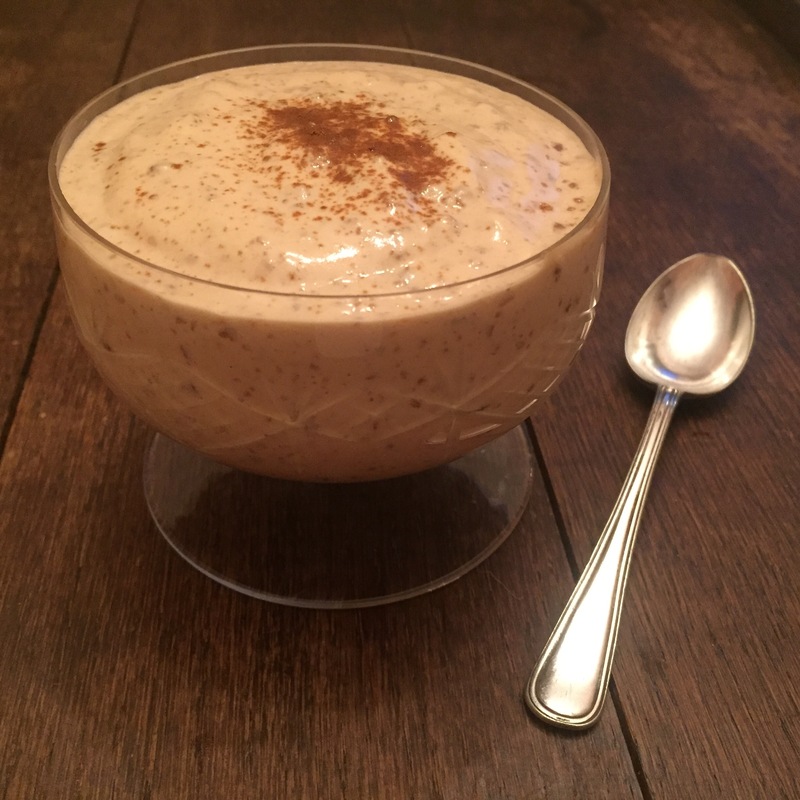 This is Coffee Cream and is delicious even though I messed something up along the way and ended up with a lumpy dessert rather than the smooth, creamy dessert I think I should have got. I think I left the coffee part to set for too long before mixing it with the whisked evaporated milk so it didn’t combine well. The evaporated milk took forever to cool though so that held me up. I would still definitely try this recipe again as it’s a nice one to have in the repertoire of you don’t have cream in. Coffee Creams: Place a 250ml tin of evaporated milk in a saucepan of water (make sure it is covered by water) and boil for 15 minutes. Remove from the pan and allow to cool in the tin. (This can take several hours) Then put in the fridge to chill completely. Mix 1oz cornflour with 1/4 pint milk. Make 1/2 pint strong coffee in a small saucepan and bring to the boil. Add the cornflour and milk mixture and 2oz light brown sugar and whisk until thickened. Set aside to cool, covering the top with a damp piece of grease proof paper to prevent it forming a skin. Pour the evaporated milk into a large mixing bowl and whisk until light and fluffy. Gradually add the coffee mixture, folding in well between additions. Spoon into serving glasses and chill before serving with a sprinkle of cocoa powder for decoration. Today started with potato cakes and an egg white and mushroom scramble. The powdered egg whites are the closest thing I’ve been able to find to dried egg, it’s just not something supermarkets stock anymore! They scrambled up pretty well, though! Powdered Egg White Scramble: 1 sachet powdered egg white made up according to pocket instructions poured over dry fried mushrooms and very swiftly scrambled. The potato pancakes were fun, from the 3 medium potatoes I used I got about 12 pancakes! I snacked on them all day but I admit the birds appreciated the rest, tsk, tsk, food waste! 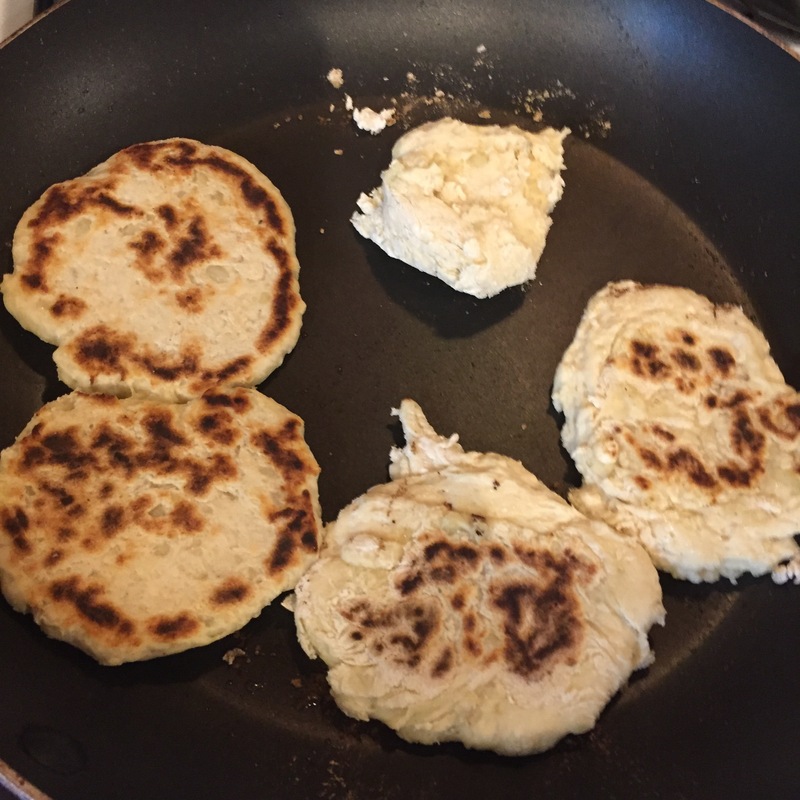 Potato Cakes: take leftover mashed potatoes and add self raising flour until you get a soft dough, almost a batter, (it will be very sticky!) for my 3 potatoes I needed 6oz flour. Melt 1tsp cooking fat in a large frying pan then dollop spoonfuls of mixture in well spaced. Let this cook for a minute then flip it over and press it down with the spatula to form a flat pancake. Cool until browned then flip over again and finish off the first side now it’s flat. You can see each stage above. 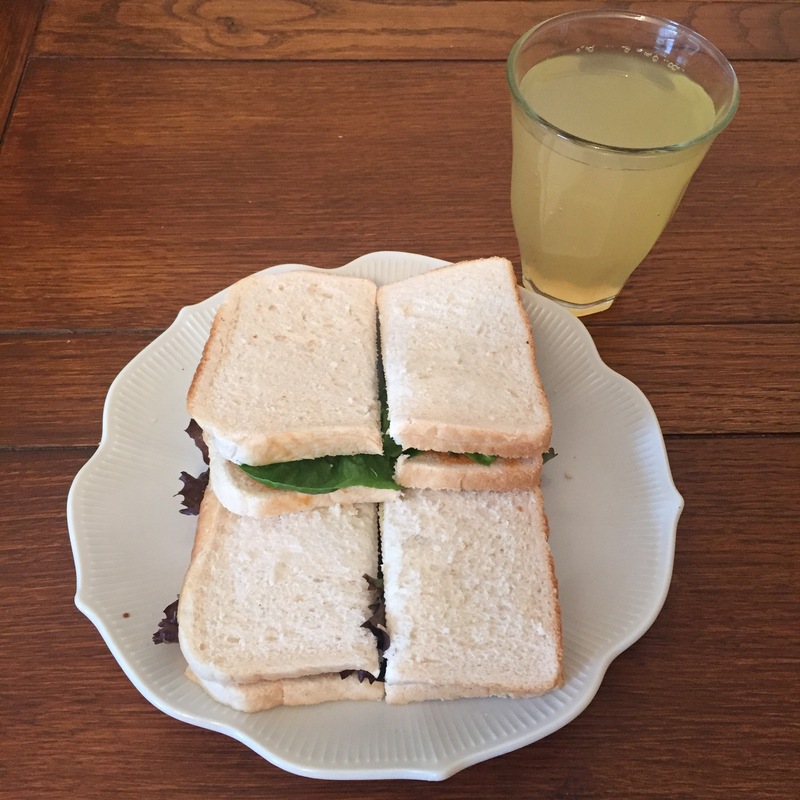 Lunch was paste sandwiches. Things like sandwich pastes were available fairly readily in 1951. I went for chicken and crab as neither of these were rationed. The chicken was alright, nothing exciting but it filled a gap! The crab paste… Well, I’m just going to have to give up on English crab. I love Asian crab but after a lot of experimenting I just don’t like crab! Unfortunately, neither does Darcy so no one will be eating that crab paste! This is my whole 4oz meat ration for the week. The butcher and I had a good chat about it and we decided that for one person mince was the only way to go. Not only was it cheap, it’s much easier to bulk it up, which is what I did! This is where things got real for me. 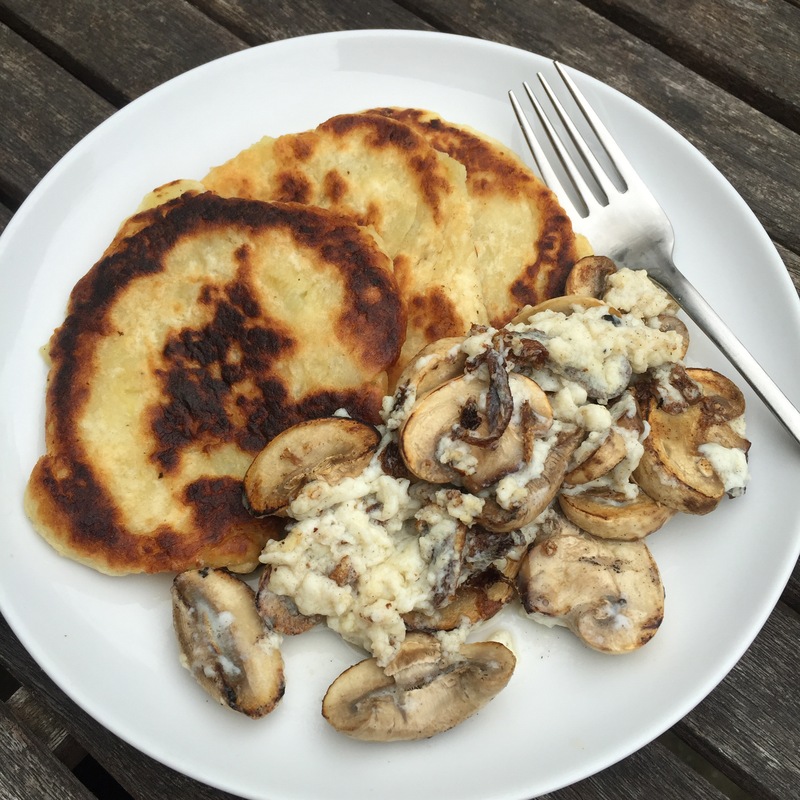 I took a whole 5 minutes trying to decide whether to use my cooking fat (which is disappearing fast!) or go for margerine, which I had been saving for baking. I was standing there weighing up the pros and cons, thinking what I might want to use each for later in the week and wondering what I could do without. This is what women went through for 14 years! Trying to think and plan and scrimp and save and eke out every little bit from their rations. The finished result! Cottage pie! This was wonderfully filling, just what I needed after a whole day down the allotment. 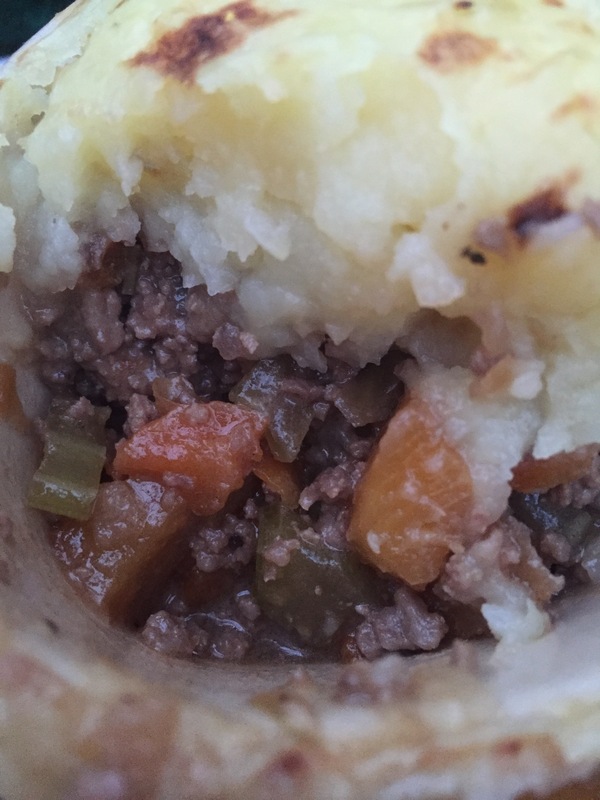 It made the mince go an awful lot further than it would have otherwise and it was flavoursome and hearty. 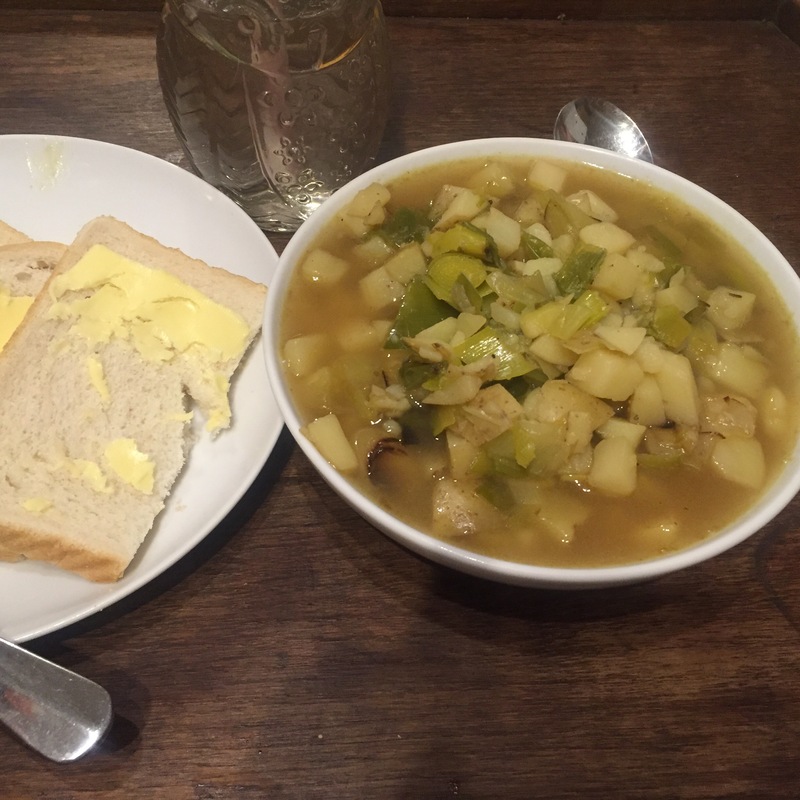 Definite comfort food! 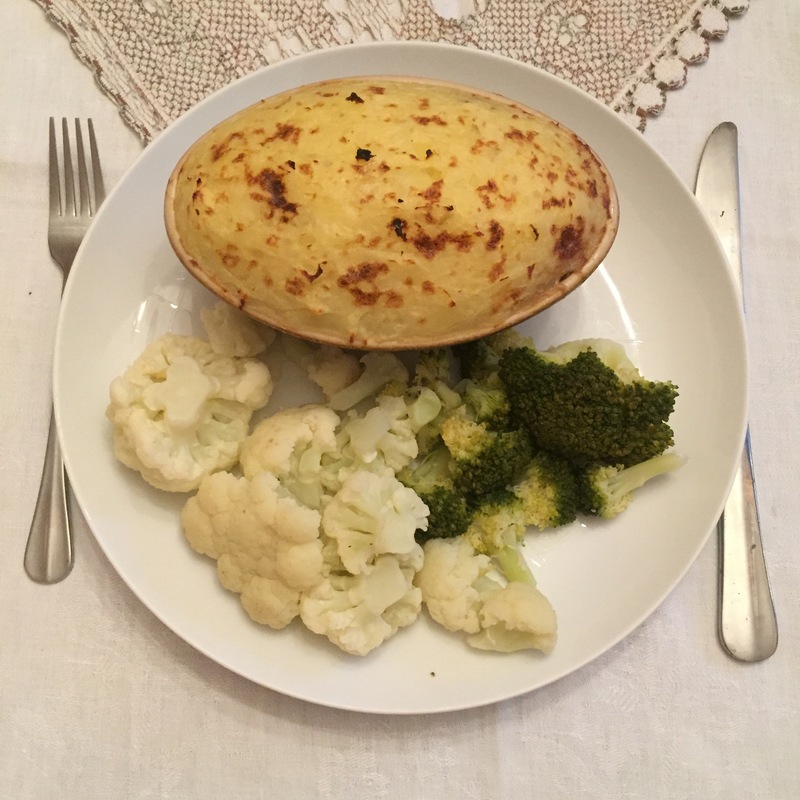 Cottage Pie: Melt 1 tsp cooking fat in a small pan, add 1/2 small onion, 1/2 carrot, 1/2 stick celery, some swede, salt and pepper and put the lid on. Allow it to sweat for a few minutes. Add the mince, half an oxo cube and a splash of water. Put the lid on and allow to simmer until all the veg is cooked. If it starts to stick then just add a splash more water. Put the cooked mixture into a single pie dish. 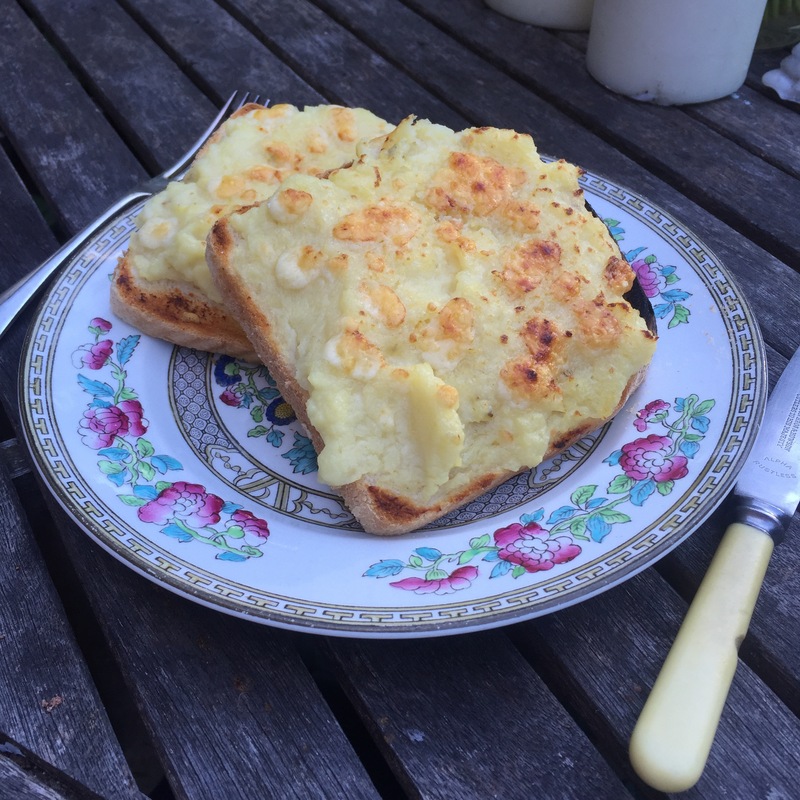 Top with mashed potato (always make extra mash was one of the rules of rationing I think! And put under the grill to brown the top. Serve with more vegetables. Pudding nearly got forgotten about today as the dogs demanded a walk right after dinner, luckily I remembered to turn the oven off before I went, leaving my Apple Crisp to keep warm. Happily I remembered it before morning and it was still nice and hot. I served it with cold custard leftover from yesterday. I was raised in a custardless household as my parents were each scarred by childhood traumas and can’t stand the stuff. (Thanks to rationing!) Turns out I love the stuff! 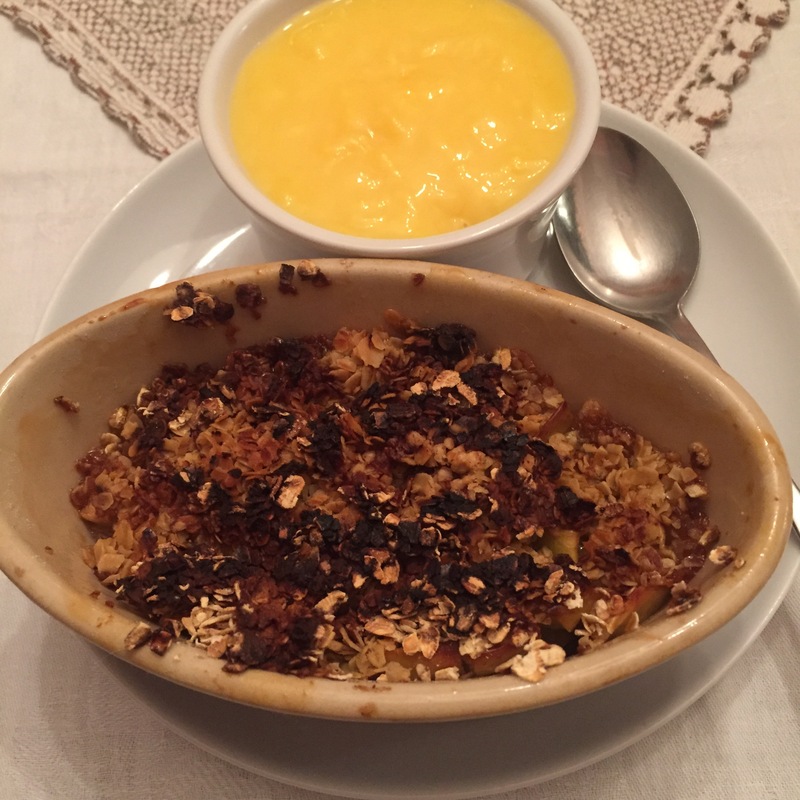 Hot or cold a tin of Bird’s custard is definitely going to be a permanent addition to my pantry! Apple Crisp: Dice 2 apples, skins on. Put in a small oven proof bowl or pie dish. 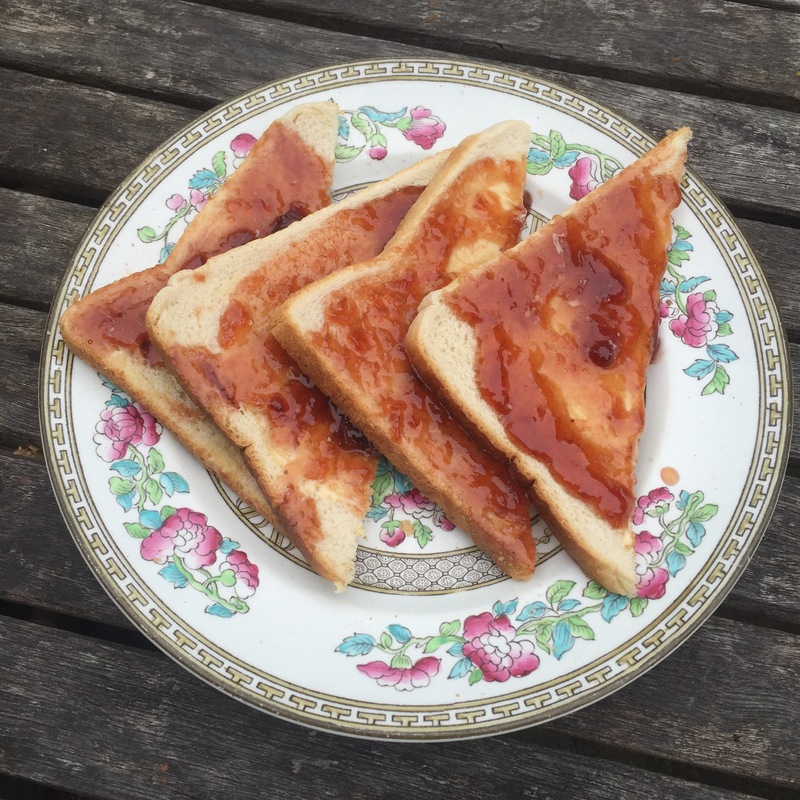 Drizzle with honey. 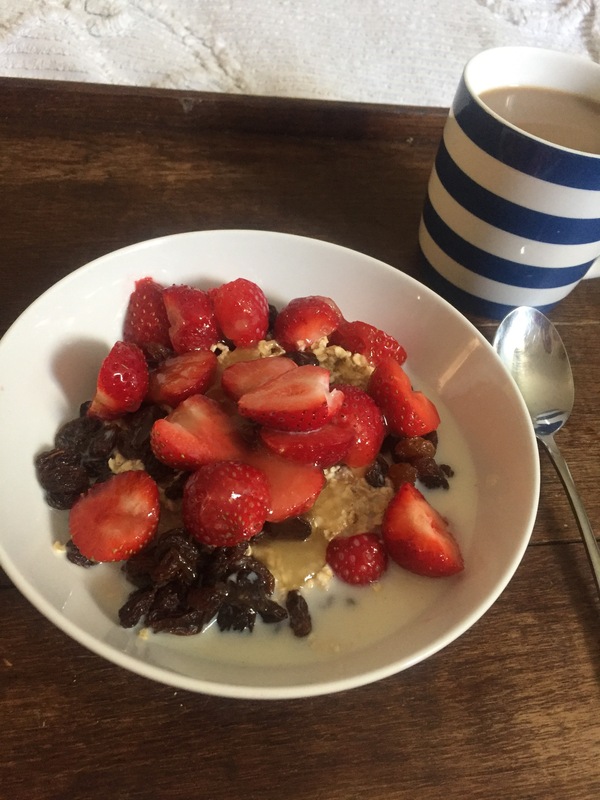 Dot 1/2 oz margerine on top then cover with porridge oats. Drizzle the top with more honey. Bake in the oven for at least 30mins at gas 4 or higher. (Can go in with whatever you’re cooking for a main course and be forgotten about!) make sure you allow it to cool a bit before serving as it will be piping hot! While working today I say with a huge pot of tea made with 2 teabags. This kept me going for hours! A pot of tea is definitely the way to go! A whole lot of errands took up my afternoon and I ended up grabbing a Sainsburys Basics sausage roll for my lunch. I figured that the quality was probably on a par with post war fare! I popped in to my local butcher and had a good chat with him. (His father ran the shop during the war and apparently there was an awful lot of ‘stretching’ of the rules going on!) I got some mince for tomorrow and a pot of proper dripping for my cooking fat ration. 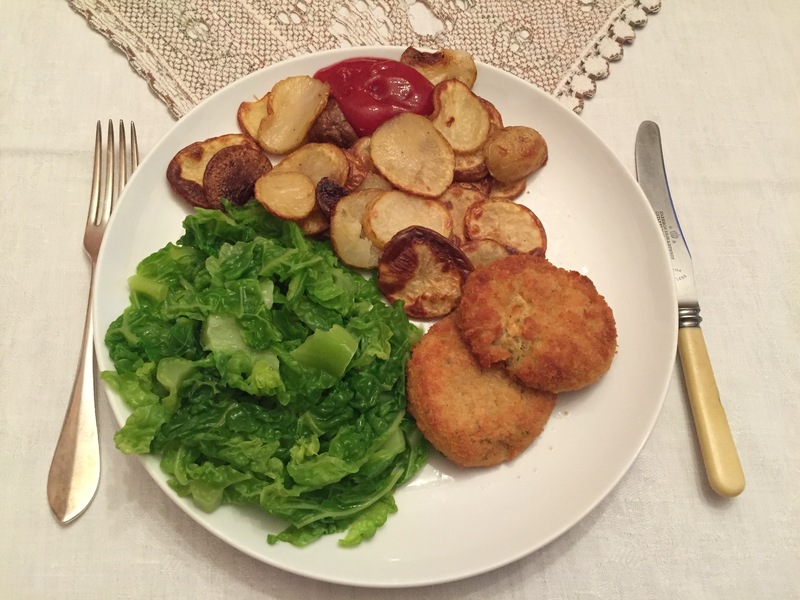 Dinner was fish cakes with oven potato ‘chips’ and boiled cabbage. I am not a fan of boiled cabbage. I love cabbage but boiling it is just rubbish! I like my cabbage braised or covered in butter. As it was I sprinkled it with plenty of salt and that helped. I do wonder what my salt consumption is looking like this week as it’s such an easy way to get more flavour out of your food! Fish cakes: Boil and mash 3 medium potatoes, (I did 6 and saved half for potato pancakes tomorrow!) Cook 1 very small (3oz) fillet of white fish (I should have poached it in a little milk, it was late so I microwaved it!) mash the fish into the potato adding salt, pepper and chopped parsley. Shape into patties and roll in breadcrumbs. Bake for 20 minutes at gas mark 8. Oven ‘chips’: Thinly slice 2 potatoes, melt 1/2oz cooking fat in an oven tray. Add the potatoes, spread out flat and bake in the oven at gas mark 8 for 20 minutes, brushing the melted fat over the top occasionally. And then pudding! I really craved something sweet last night (chocolate!) 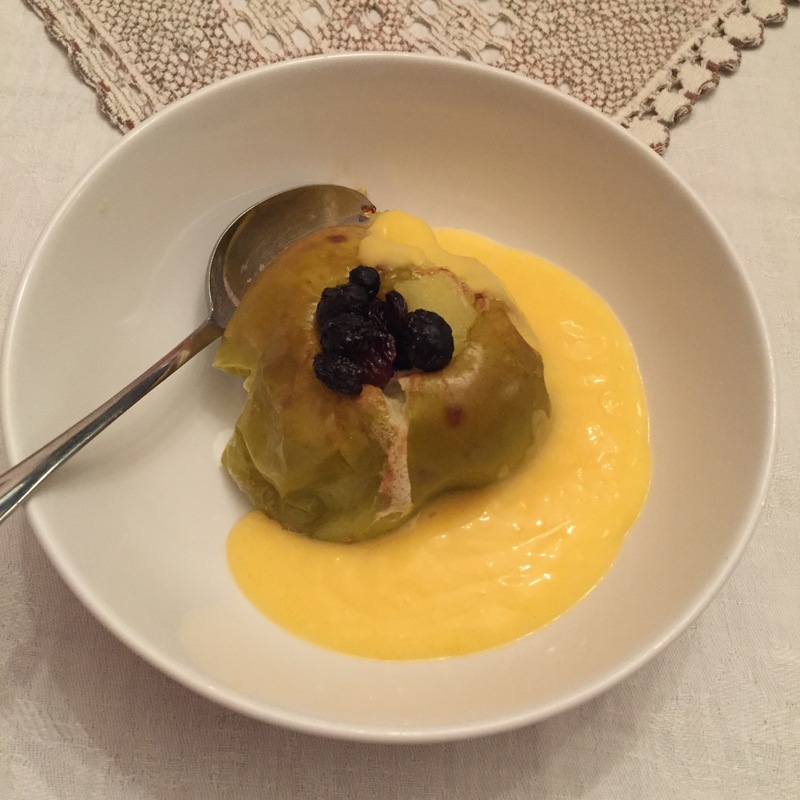 so tonight I thought I’d stave that off by doing baked apples with custard.